The previously separate village of Preston was built up in the late C19, as Brighton expanded northwards. 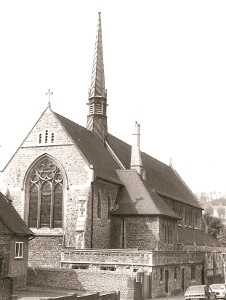 The small mediaeval parish church of St Peter was inconveniently located by the manor, away from the new houses. A new one was built in 1900-02 as a plaque records, designed by Sir A W Blomfield and Sons. As Blomfield was dead that means his sons – A C Blomfield and C J Blomfield. Like much of their work, it combines high quality of construction with some mannerisms and self-conscious oddities that do not disguise the way they worked to a formula. The boarded wagon roof shows their usual high standard of carpentry. A familiar mannerism is the projecting west baptistery, entered through the centre of three arches. The low arcades are joined to the lofty chancel arch by curious quarter bays. Above this is a prominent lead-covered flèche, for no tower was intended. The exterior, finished in rough stone, has lancets except for a traceried east window; inside this is surrounded by blank arches and shafting. It is set high up, to allow space for the reredos (see below) underneath. Repairs by J L Denman and Son were carried out in 1965 (ICBS). Font: Life-sized angel holding a shell, supplied by J Whitehead of Westminster (signed), to a design that originated with the Danish sculptor Thorwaldsen. 1. (East window) Ward and Hughes, 1920s (WSRO Fac 2980). 2. (South aisle fourth and fifth and north aisle, second windows) C E Moore, 1928-35 (one signed). Pulpit: Stone with marble shafting. In style it looks older than the church, though this is unlikely. Reredos: Large and stone, with the Ascension, by H Hems of Exeter, 1908 (BN 95 p111).